By Anders B. AOR It were at last year’s G.M, that Blutgeist OR gave a talk and meditation on the hammer and what it means to us that bit deep into me, to the point that I had this overwhelming feeling to make a hammer to be of a high enough standard to represent our faith. By Rory H. AOR I read a while ago a quote about the Odinic Rite being as a rock in a rapidly flowing river, resisting those forces which are constantly trying to wash it away and lose our holy faith forever. I agree totally with this thought but I consider that there is more to this statement than initially meets the eye. By Shawn E AOR Being new to the Odinic Rite can be a tricky thing, as there is much to learn and much to unlearn from previous paths traveled. However, I have found something that has helped me in several ways in my daily life. That is daily meditation and use of the Folk Spirit CD. This year we a repeating this event and we would like as many Hearth’s, individuals and friends of the OR as possible to get involved and plan an activity or activities for some time over the designated weekend. Snowflakes not only remind us of Winter, but also of Hagalaz the rune for Winter and regeneration. https://i1.wp.com/odinic-rite.org/main/wp-content/uploads/snowflakes.svg_.hi_-e1551149418388.png?fit=400%2C180&ssl=1 180 400 Hengest http://odinic-rite.org/main/wp-content/uploads/2016/05/or-badge400-transp.png Hengest2011-12-30 00:17:382019-02-26 02:54:49Snowflakes! Every year Donar's Hearth OR and the Odinic Rite Vinland host a Yule Celebration. The following booklets contain Yule Carols, Crafts, and stories to use through out the Yule Season. We use them every year at our gathering, an everyone - young and old alike - enjoy them. We hope you do too! On 25th Shedding 2260re one of our founding members, John Yeowell, better known as Stubba in Odinist society, passed from this realm at the age of 92. We are very pleased to announce the release of "Folk Soul - A Second Compilation of Odinist Artists". 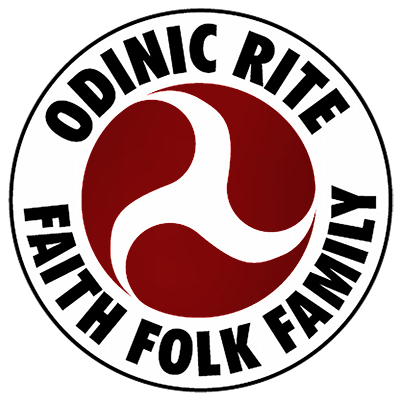 Folk Soul is the second release on the Odinic Rite Media label and is the sequel to "Folk Spirit - A Compilation of Odinist Artists" The album features 15 unique track by 14 different artists and will appeal to a wide variety of musical tastes with various genres represented. By Heimgest DCG Thankfully our folk also have many heroes from the past who not only can inspire us today but also give us a sense of who we are. It is for this reason that many modern state operated educational establishments (or so called educational establishments) no longer teach the history of our people. The New Awakening is at a stage now where we also have heroes from the much more recent past– truly Odinic heroes and heroines who have dedicated themselves to the restoration of our ancestral way.